Ola Kaso, (right), poses with Michigan U.S. Senator Carl Levin. 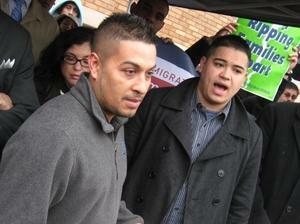 Dream Act critics say the bill is a way for illegal immigrants to get around the law. The Detroit office of Immigration and Customs Enforcement is under fire for what critics are calling aggressive and overzealous tactics. ICE officials say they are concerned enough that they're reviewing a recent incident involving immigration agents. But the union that represents agents is complaining that ICE isn't standing behind its officers. The principal of Hope of Detroit Academy, Ali Abdel, says he was helping out with morning safety patrol on March 31, just like he does most mornings.